For the past decade the Kaurna Welcome, acknowledgment of country, and official opening, had been presented by highly respected elder, Stephen Gadlabarti. Sadly ‘Uncle Stevie’ passed away unexpectedly last year but the role was ably taken up by his son, Jamie Goldsmith who, along with Uncle Brian Goldsmith, Jack Buckskin and the Taikurtinna dancers, paid tribute to his father, and once again brought community and spirit together with joy, playfulness, grace and passion. Lively Brazilian band Bixiga 70 could not have been a more fitting way to get bodies moving and ears smiling! 10 piece energetic Afro-funk infused beats complete with driving baritone sax and piercing trumpet stabs…heck yeah! If loud groove music is not your thing, in complete contrast, Rahim AlHaj Trio provided a more subdued but equally powerful set away from the speaker thumps on the more serene Novatech Stage as bats circled overhead in a perfect setting for the sublime blend of, oud, santour and percussion. 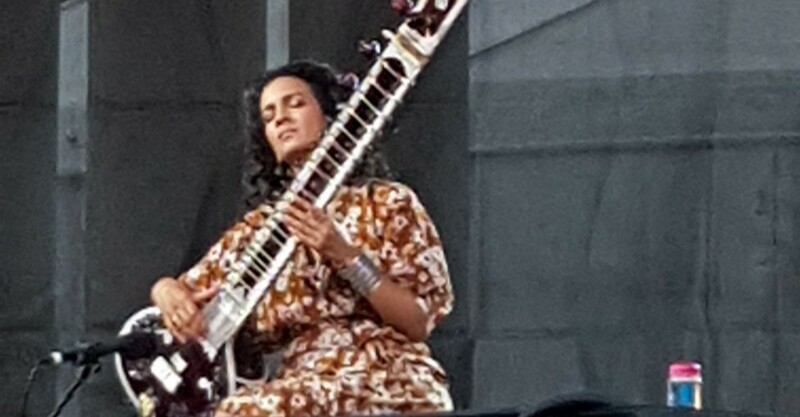 WOMADelaide is never short of choice across numerous stages: Tank and Bangers made sure bodies continued to move and hearts lifted with emotional slam poetry from dynamo Tarriona ‘Tank’ Ball, Anoushka Shankar (pictured) mesmerised with her sitar, the irrepressible Hypnotic Brass Ensemble ‘got the party started’, and Rodrigo y Gabriela shook the trees with their explosive Mexican-Heavy Metal infused duelling guitars. The highlight for me, however, was the extraordinary angel aerialists Gratte Ciel, who zip-lined overhead and left everyone spellbound with many thousands of white feather-snow circling and drifting in the air. Friday night is about settling into four days and nights of festival, communicating with people, aligning with culture and disconnecting from stress. And so, as the festival’s opening night morphed into Saturday, Jamie Goldsmith’s concluding words accompanied me out the gates, ‘Nakana’: ‘til we meet again. Without doubt music heals but WOMADelaide connects! Book at womadelaide.com.au or 1300 496 623. Click HERE to purchase your tickets. Without doubt music heals but WOMADelaide connects!